A little sneak peek of some blocks from the quilt I am making for a new doll quilt. Aren't they cute? They each measure 3" unfinished. These little stars are quite addictive and fun to make! I love your double pink stars! 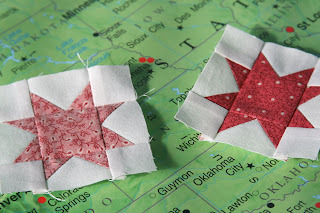 I need to get started on some itty bitty sawtooth stars for my quilt . . . thanks for inspiring me. You have way more patience than I do. They're adorable! That star is one of my all time favorite blocks and add to it that they're tiny -- perfect! They are very pretty--and yes they are addicting, I have made several this month practicing for the next Doll Swap! I'm a friend of Leslie's new to your blog, and I am hand quilting a baby blanket for my sister (for the first time)....since you seem to have the experience any suggestions to avoid pitfalls? Do you use clear thread to hand quilt? Since your profile is not public I can't find a way to get in touch with you... hopefully you will read this. Personally, I would not use clear thread to hand quilt. I don't think I could get it to be secure enough. Also, it is recommended that you never use the monofilament thread in a baby blanket because babies have been known to get a finger or toe stuck in it if it comes undone slightly, and cut off the circulation to their toe. There are threads made specifically for hand quilting, but if you don't want one, or can't find a color you prefer, you can use a thin regular cotton thread, pulled through beeswax (this helps prevent knotting) to hand quilt. I am doing that right now... although I don't like it because the stitches can hardly be seen.